Without question, Roots Hall Stadium, Southend (well Prittlewell to be exact) is my football Mecca. Sure, I’ve been to Old Trafford, Anfield, St James Park (Newcastle & Exeter) even the Nou Camp, all fantastic venues, steeped in history and homes to some great footballers, but you can keep the lot of them. When I’m at Roots Hall, I’m at home! It’s not the prettiest of football grounds and I’ve heard all the songs from visiting supporters too – “Shite ground, no fans” and the inventive “My garden shed is bigger than this” – but it matters not. Manchester United, Tottenham, Newcastle, Sunderland, Leeds and of course West Ham, they’ve all come down and turned their aristocratic noses up, and all been sent home with their tails between their legs. I might also add that at this very same venue, I’ve seen the Shrimpers turned over by the likes of Newport County, Torquay and Mansfield! 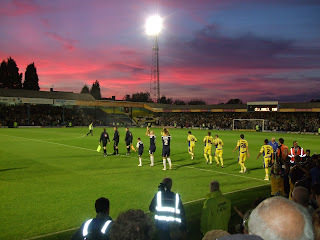 Roots Hall was the first, and subsequently the last place I watched League Football with my Dad. I’ve seen games that range from the comical to the classic. As it turned out my final visit with Dad just before Christmas 2003 saw the comical side of the Shrimpers. Totally dominated the match, missed two penalties before losing 1-0 to Bristol Rovers’ only shot of the game, and oh yes, to add insult to injury my mate Ed was thrown out after a heated barrage of ‘friendly advice’ towards the Rovers bench, a typical Roots Hall on a Saturday afternoon! Just after, on Christmas Day 2003, Dad was taken from us and part of my footballing childhood went with him. I’ve fallen in and out of love with Southend United almost every week since the mid 1970s. The club has an uncanny knack of collecting all your hopes, wishes and dreams, building them up and then crushing them. Yes, supporting Southend United can be bloody hard work. You’re in it for the long haul and there is no escape. Our relationship has stretched my footballing emotions to their very limits. We wouldn’t want it any other way! Although I’m sure fans from the likes of Orient, Brentford, Walsall and Colchester would make a similar claim. My earliest memories of visiting the ground go back to the early 1970s. I can only have been about three or four years old when my mother and father took me to the Roots Hall market. I remember Dad taking me through the gates at the top of the old South Bank and pointing out the groundsman marking out the pitch. “Do Spurs play there?” I asked (Spurs was my Granddad’s team). “No, Southend United”, replied Dad and that was that, I was a Shrimper! I can also remember sitting in the stand watching the annual firework display – it wasn’t until the mid 70s that I was taken there for a football match. We stood on the South Bank for those early matches. The huge terrace could hold up to 16000 people, around half of the ground capacity. You got a great view of the action, but the place we all wanted to be was at the other end of the ground in the North Bank. That was where the action was, the singing, the atmosphere. It was as if you graduated to the North Bank when you were ready. The noise in there was something else. Toward the end of the 70s Southend were promoted from the Fourth Division to the dizzy heights of the Third and in 1979 Roots Hall victories over Peterborough and Watford (in a replay) saw the Shrimpers paired with European Champions Liverpool in the third round of the FA Cup. Of course everyone at my school jumped upon the Blues bandwagon, even kids who had shown no interest in football were now donning blue and white scarves and knew the names of Southend’s star players such as Cawston, Moody, Morris and Parker, but I don’t think any of us really believed that our team could live with the likes of Dalglish, Hughes and Kennedy. I remember Dad and I arrived for the big match some two and a half hours before the kick-off. To our amazement there were already around five thousand people in the ground. It was a bitterly cold night, an evening snow storm covered the pitch, but with a record 31,033 crammed in there was no way the match was ever going to be called off. The ground staff remarked the lines in blue paint, and the white match ball was replaced with a bright orange one. As it turned out, manager Dave Smith had Southend fired up, only some quick thinking by England goalkeeper Ray Clemence, kicking clear when Derrick Parker was clear on goal, saved Liverpool from what would have been one of the FA Cup’s biggest upsets ever. For weeks after that 0-0 draw and indeed the 0-3-replay defeat at Anfield, I was still pinching myself that my team of journeymen had held one of Europe’s elite. I put those feelings down to being a child more so than ‘Cup fever’ however, I’m delighted to report that some 28 years later I experienced the very same emotions when Southend shocked a star studded Manchester United in the League Cup. Despite neither side scoring, Southend and its players were national headlines as well as becoming heroes of the school playground. Everyone claimed to have been at the match and many counter claimed that they knew one of the players. All this may well have been true but when Chesterfield visited for a Third Division match a couple of weeks later, the hoi polloi had returned to supporting West Ham, Tottenham and Arsenal. The match was attended by fewer than 5,000 people, 26,000 less than the previous match!!!! As a lad I spent hours at Roots Hall, waiting for the players to finish training so I could get autographs. I remember asking if I could spend a day at the ground watching the players practise. Reserve team manager and former Blues defender Frankie Banks invited me along and showed me around the ground before asking me to return that evening in my Southend kit to be mascot for the Reserves. What an honour, at the age of twelve I was to lead out my team (albeit the 2nd team). Unfortunately I didn’t turn out to be lucky, as visitors Exeter City ran out 3-1 winners. By now I had my first Roots Hall hero. Ronnie Pountney was your typical Third Division player. Released by both Walsall and Port Vale in his native Midlands, Pountney drifted in to non-League football with Bilston Town before being spotted and signed by Southend. Ronnie was quite small for a professional footballer but more than made up for it with his sheer effort and determination. He became an immediate crowd favourite. During an eleven-year spell Pountney won the club’s player of the year for three seasons in a row. He is still the only Shrimper to have achieved this feat. I even shared my admiration for the Shrimpers’ midfield dynamo by writing a letter to the club’s programme editor, which he duly published (the things you do when you’re 13 years old!). Later in life I was lucky enough to play against Ronnie in a charity match, I’m pleased to say he’d still got it! Another Roots Hall favourite was Stanley Collymore. When he arrived from Crystal Palace nobody had heard of him. He was an instant hit. I, like many Shrimpers fans, will never forget his goal against Bristol Rovers when he beat defender after defender before thundering in a shot from way outside the penalty area. Some thirty matches later his goals had not only saved Southend from relegation but also secured him a multi-million pound move to Nottingham Forest. Despite a few personal problems off the pitch, Stan is still highly regarded by the Roots Hall faithful. I’ve always found him willing to sign autographs and chat whenever he’s been in town. Southend have been blessed with a number of classy strikers, particularly in recent years. Along with Collymore the likes of Richard Cadette, Brett Angell and Freddie Eastwood have captured the imaginations of the Blues support. In fact Freddie Eastwood threw up my first father/son heart to heart football chat with my older son Alfie. Freddie was Alfie’s first football idol. When his goalscoring exploits led to a one and a half million pound move to Wolverhampton Wanderers I had the unenviable task of breaking the news to the little man. I’ll never forget the picture of disappointment on his face as I explained that his hero was going to play for another team. The truth is I felt his pain too. The first lesson of supporting a team like Southend is that the good players tend to move on. Despite being little more than an average park footballer myself, I’ve been lucky enough to play on the hallowed Roots Hall turf no fewer than thirteen times scoring four goals, a record I’m extremely proud of, and one of which several of the Shrimpers’ less successful strikers would be envious! A match day at Roots Hall is a real Jeeves family day out. Along with myself, regular attendees are my wife Victoria, mum Eileen (who started coming to football after we lost Dad) and my two sons Alfie and Stanley (familiar name at Southend?). The boys were both at Southend matches within weeks of their birth, well, I wouldn’t want them growing up West Ham now would I? The memories of Roots Hall are endless, the place has a habit of luring me back in no matter how bad the Blues are performing, a prime example of this was back in the late 80s. An old girlfriend talked me out of going to a Friday night fixture at the Hall against Fulham. Instead we were going to the pictures then on for a meal. As she drove up to the Victoria Avenue traffic lights she noticed me looking up at the bright Roots Hall floodlights. “If you want to go to the game you can,” she said. Now the male understandings of our female counterparts have always been somewhat patchy. Apparently at this point I’m supposed to have replied, “No darling, that’s OK, I’m looking forward to the movie.” However I…well, I don’t have to tell you what I did. Southend and Fulham drew 0-0 and I suffered three days of silence! Another Roots Hall moment came at the end of the 98-99 season when Southend entertained Hartlepool. Although nothing was at stake, the game was to be the final Football League appearance for Hartlepool’s former England international Peter Beadsley. I was keen to have a memento of the great man’s final match, so much so that I decided to try and get his last playing shirt. As the match was brought to its conclusion I climbed onto the perimeter track before heading towards the tunnel. I must have looked important as the lone steward nodded at me and let me past. After walking past the pressmen in the tunnel I only had to get past one more steward before reaching the visitors’ dressing room. The steward asked where I was going and in the worst fake Geordie accent ever I replied “Hartlepool dressing room”. He stepped aside and let me through. I opened the dressing room door and Beadsley was sitting opposite. I asked if I could have his shirt but he told me it had been thrown to the Hartlepool supporters. Immediately afterwards he reached into the kit box, pulling out the number 14 shirt that had been worn by Pools goal scorer Paul Stevenson. He signed it and handed it to me. Mission accomplished! September 2008, Southend have a Tuesday night home fixture against Leyton Orient in the Johnstones Paint Trophy. The team have just returned from a five goal stuffing at Walsall. Talk in the pub is of our awful defending and the possibility of relegation, a real picture of optimism! Orient very rarely lose to Southend and with a tough trip to Carlisle to come we are a pretty miserable bunch. But hey, we would be lost if we had nothing to moan about. Tonight we are at home, with a chance to beat our local rivals – ask yourself, does it get any better than that?